In July 2016, we launched LEARNATIVITY, our 52-foot steel cutter back into the water after nearly a year on the hard in Fiji. The boat was looking better than ever after a new paint job, and while we loved cruising in our sailboat, we had also been working for more than a year on the plans for our new power passagemaker. As the design had progressed enough, we’d decided it was time to look for a yard to build her in. Wayne and I knew from the beginning that we would prefer to build our new boat overseas. While we were really looking forward to getting back to cruising as soon as possible, we also were aware that the journey is as important as the destination to us. I know from experience that building a boat always takes longer than you think. We wanted to enjoy living in the place we chose to build, and since we love travel so much, we expected it probably would not be in the US or Canada. Since we would be living there for years, we hoped to find a place where we could learn a new language and culture. Also, we were hoping to find a place with highly skilled workers, but also with labor rates we could more likely afford. Ever since we had traveled to Turkey in 2014 to do research for a book I was writing, we had had our eyes on Turkey. We loved the people, the culture and the food, so it would be a great place to live. We’d read about this area in Antalya called the Free Zone in an article in Power & Motoryacht Magazine. We knew they had skilled workers for building in wood and fiberglass, but we weren’t certain about aluminum. But we didn’t want to narrow our search too much at that point, so we researched aluminum boat building all over the world. Eventually, we came up with a list of builders. Our yacht designer, Dennis Harjamaa of Artnautica, put together an estimation package for us that he sent to the boatbuilders on our list. In the end, our list included builders in New Zealand, Holland, Tunisia, Turkey, and later, in Louisiana, USA. We are also cold weather wimps, and while we looked at several builders in the Pacific Northwest, both in the USA and BC (where Wayne is from), we knew they could build us a fabulous boat up there, but the cost of living was high and we were hoping to find a place with a warmer climate. Wayne decided to travel to meet with some of these boat builders and meet them face to face. In our estimate package, we had defined four stages of the build, and we were asking builders to bid on any or all of the four stages. Stage 1 is the hot works: all the aluminum hull, tanks, decks, and superstructure. Stage 2 is power away. Stage 3 is all boat systems installed with rough interior. Stage 4 is turn-key finished boat. For this trip, Wayne had scheduled meetings with two builders in Turkey, one in Antalya, one in Izmir, and another in Bizerte, Tunisia. While Wayne was off meeting with the builders in Tunisia first, I was in Nadi, Fiji aboard LEARNATIVITY at Vuda Point Marina. We had a young Fijian man working for us to complete the last bits and pieces of our refit. He was installing the new insulation in the engine room and painting the bilges. In addition, I was writing a new book, which is my real day job and helps to keep us in provisions. 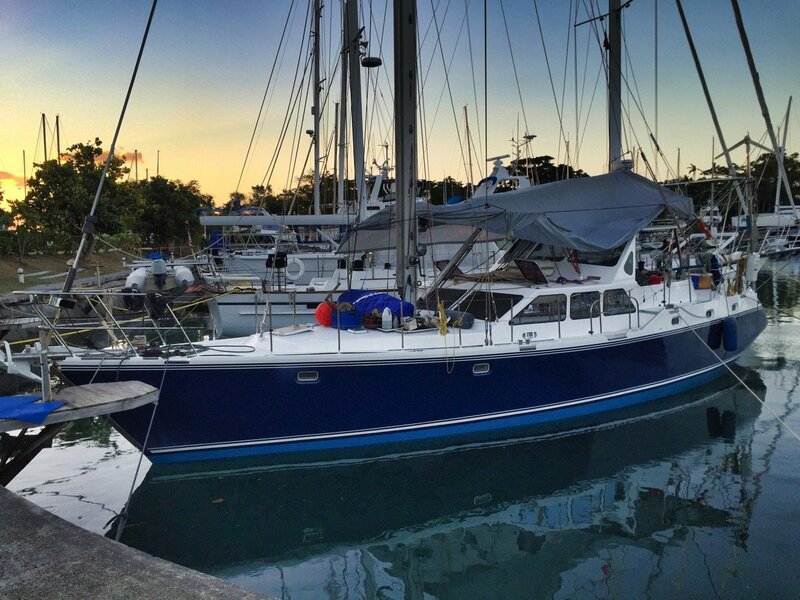 As I Skyped each day with Wayne and got more and more excited about our new build, I decided to post on the Trawler Forum website about Switching from Sail Cruising to Power Passagemaker. I was asking if anyone had information about building aluminum boats in Turkey. Those of us who read these posts on this forum know that it is an international group. There is a vast amount of knowledge among the group, and I was a bit tentative when I posted. I was hoping mostly about making a connection with another cruiser who knew of boats that were being built in Turkey. It never occurred to me that builders would be reading my post. The difference in the time zones between Fiji and Turkey is huge, and Wayne and I could only Skype in early morning or late evening. I remember checking my email at the same time Wayne was in Antalya, and there was an email from a builder I’d never heard of who was also in the Free Zone: Naval Yachts. I saw your ideas about your plans to build an aluminum boat in Antalya in a forum. We are aluminum boat builders in Antalya Free Trade Zone, center of boat building industry, and also we give engineering and design services as well. 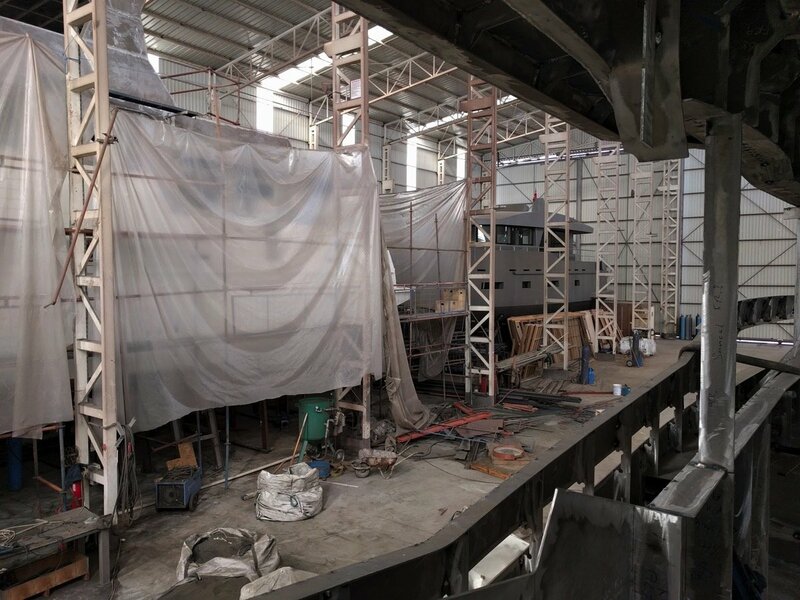 We are currently building our aluminum hybrid motoryacht: GreeNaval 45. I don’t know what is your status now about building a boat but please feel free to ask your questions. Your contribution is very well appreciated as a sailor with enthusiasm. Talk about serendipity! Wayne was in Antalya at that very moment. He had finished his two days of meetings with the other builder, and at that time he was asleep. His Sunday morning would soon be dawning, and he was expecting to leave in the morning to start the drive up to Izmir. I forwarded the email to him and somewhat doubtful that they could make a connection on such short notice – and on a Sunday, to boot. Amazingly, Baris checked his email a few minutes later and answered. He arranged for Wayne to go to their yard that morning, and they showed Wayne around their sheds and the different projects they had underway. They next time we Skyped, Wayne was bubbling over with enthusiasm for both of the yards in Antalya. We felt so fortunate that he had been able to connect on such short notice with Baris and Dincer, the partner brothers who own and run Naval Yachts. It was months before all the bids were in, and we continued to work with Dennis on all the thousands of small design details that go into making a boat. In October, we left Fiji and sailed to New Zealand where we met with Dennis and had a meeting with the New Zealand builder. Eventually, we narrowed it down to the two builders in Antalya, and one year after the first visit, Wayne flew back and met some more. In the end, on March 15th of this year, my birthday, we signed a contract with Baris and Dincer Dinc of Naval Yachts, the builder we chose due to serendipity and the help of the Trawler Forum.